The nightmare scenario goes like this: You spend months, maybe even years, searching for a home that's just right. You make a bid, close the deal, move in, and wham — you discover all kinds of secrets about your formerly-perfect home. Suddenly it seems like an uncomfortable money pit. The only way to combat this situation is to be ahead of the game — research, research, research. 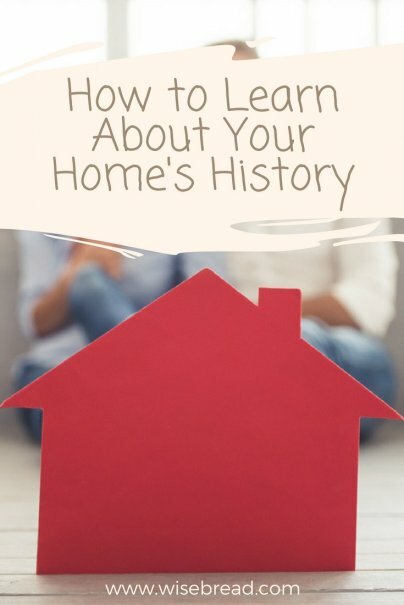 You need to know all the details about your home's history. What you see is not always what you get, so you need to pull back the figurative (and maybe literal) dry wall and learn the true story. How, you ask? Luckily, we live in an age where historical documentation is plentiful if you know where to look. Below are a few tips to learn the history of a home before you buy it, or even while you're living in it if you want to know what dangers might await you. We love the charm of historic homes: the details, the ambience, and the knowledge of the role they played in the life of our community. When buying a historic home, there are many things to consider. The home may need a lot of work (which always translates to sweat equity and financial investment), repairs may be more expensive, and future changes may be limited. The National Historic Landmarks Program is one place to look for answers about the home. A simple Google search can also be helpful. If those don't turn up anything, check directly with your city or town, including any local historical societies, archives, and libraries to verify your home's status. It's just as important to investigate your neighborhood's history as it is to investigate your home's history. You will spend a good deal of time out and about, and information about the neighborhood and your neighbors' homes can prove useful. Have there been any kinds of infestation in the neighborhood? Was lead a commonly used building material in any of the houses? What are the crime rates and incidents? Any sinkholes or soil issues? All of this information should inform your buying decision. Look through newspaper archives, police records, assessment and city planning records, and again check with the historical societies and library. One interesting fact that speaks to the history of urban sprawl is the distance of the home from the city center. The farther you are from the city center, the more likely the home is a part of urban sprawl, and therefore, the younger the home likely is compared to others that are closer to the city center. Inspect wooden rafters in the attic, exposed brick, wallpaper, paint, doorknobs, windows, fixtures, baseboards, and the molding. Even the interior architecture such as the placement of the kitchen, the shape of the doorways and archways, and the tile work in the bathroom and kitchen can provide signs of the home's age. There can be trend clues, sometimes even a date stamp, on any of these that could indicate a possible time frame when the house was built, remodeled, or renovated in some way. Neighborhoods are comprised of people, and where there are people, there is oral history. Chat with your new potential neighbors, local business owners, dog walkers, mail delivery people, local church or community center staff, and any people doing any kind of house or property work in the neighborhood. Longtime residents can often provide a wealth of history that is hard to find any other way. All of the legal records of a property are publicly accessible. You can likely find them online, though if that doesn't give you the results you want, go to your city or town hall to access them. In these records, you will find tax records, which indicate how the value of the property has changed over time; and the deed and title, which can tell you who owned the home, when they owned it, and for how long. When I lived in Washington, D.C. for a few years, I considered buying a home. My agent tried to get me to waive the right to an inspection, but I refused. An inspection not only reveals mechanical flaws in the house, but also a high-quality inspector can tell you a lot about the home's history because they know what to look for to properly date a home.